If you are planning on watching the Olympics this summer or hosting a party to celebrate, why not make some bunting to decorate! 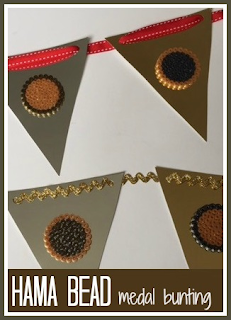 This mini bunting uses metallic Hama beads made into little medals and strung up on cardboard flags with cheerful ribbon. First make your Hama bead medals. I used the circular template and made circles that were 9 beads in diameter, using a contrasting colour to make a border. Iron them so that the beads melt together, ironing more on the reverse to make sure that the beads are well fused. I made three Hama bead medals for each string of bunting. Make a paper triangular template for the bunting and cut out a bunting flag for each medal in a selection of metallic colours. Then use the Bostik Fine and Wide Glu Pen to stick the Hama bead medals to the cardboard flags. Use plenty of glue to make sure that they are well stuck, and leave until completely dry, preferably overnight. Use a hole punch to make holes in the top corners of the flags and thread through with ribbon. Hang up your bunting and enjoy! You might also like my other Olympic crafts - making collage Olympic rings and a simple cardboard tube Olympic torch. Thank you! I found this month quite challenging!